Place one atop Q's Tent side deck (up to 13 different cards face down and up to 13 different cards face up) during the seed phase. Q's Tent is now open and in play. Your other Q-related side decks are closed and cannot be opened or reopened. You may not play Q's Tent during your turn. You may not begin mission attempts with less than four personnel. Card logging info: First edited by Telak at Feb 27th, 2013. Please support openCards and validate game text of this card! 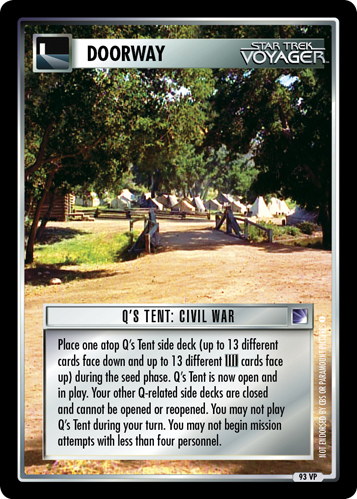 There are 4 entries for Q's Tent: Civil War (ST1E 0 VP 93) at the Tradeplace (2 haves and 2 wants). Click here to see all trade list entries for this Virtual card! Also see here for all trade lists with any card fom "Virtual Promos".